I've been super into lacy peter pan collars lately. In fact, I'm making two dresses that have them! (Both are variations on Simplicity 1609.) 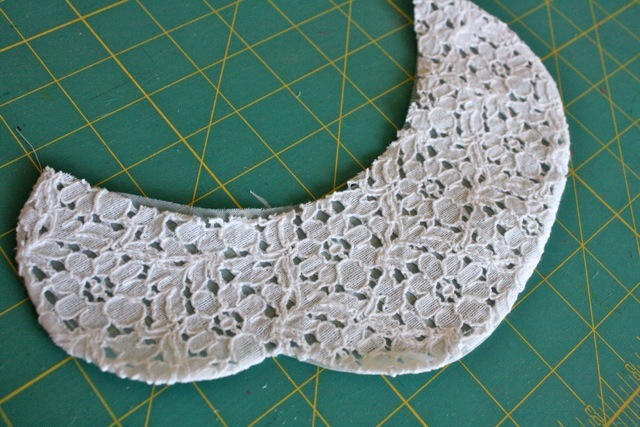 Both collars were cut from yardage, either lace or eyelet. 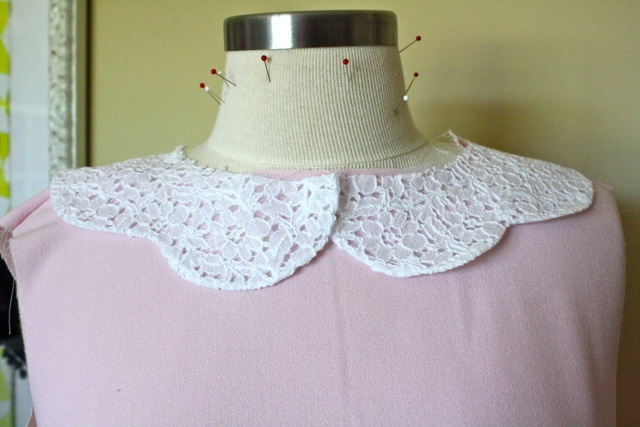 Originally, I cut both the upper collar and the under collar out of the lace/eyelet. But two layers of the lace on top of each other didn't work--it obscured the lace pattern and made the whole thing look heavy. I had already been thinking I might need a sheer fabric for interfacing the top collar. So a solution popped into my mind: an organdy undercollar! 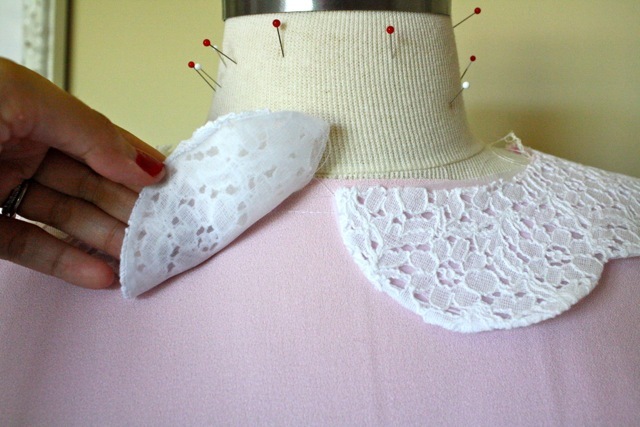 This way the undercollar would provide support and transparency. I bought 1/2 yard of very sheer cotton organdy to cut the under collars out of. 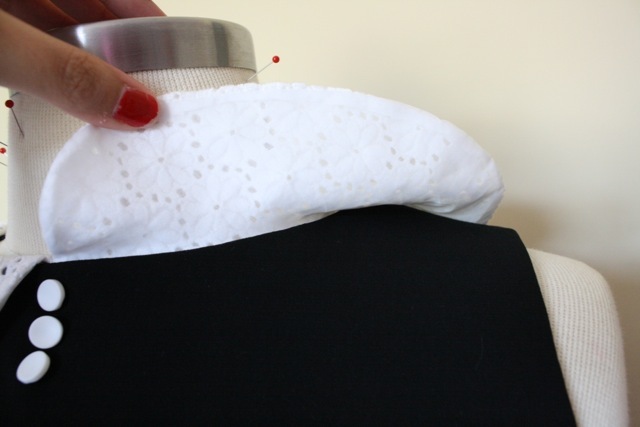 I looked for something relatively stiff, that could stand in for the role of interfacing. Silk organza would work well too. 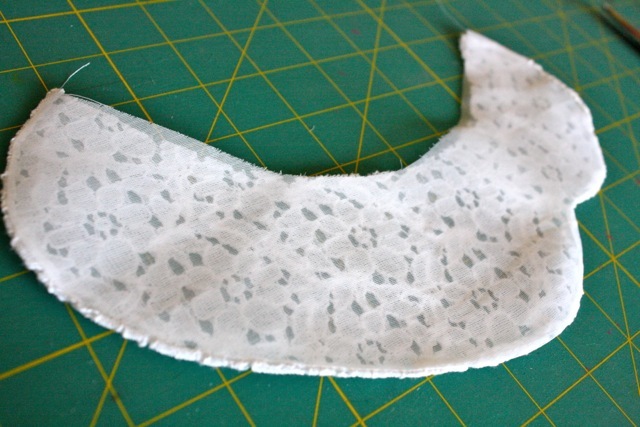 I just sewed the collar as usual (see my tutorial here) and trimmed the seam allowances down to a scant 1/8". When pressing, I made sure that the organdy was rolled to the underside of the collar. 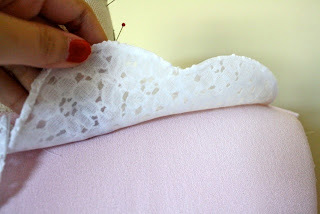 Here you can see the technique in lace, in progress. I love how you can still see the lace motifs so clearly. Anyway! Just a little tidbit to keep in mind any time you need sheer support in a garment. that is a great idea I can't wait to try it out, thanks for sharing. I think I would introduce a third contrasting color just for funsies, different from both the eyelet and the body of the dress. Yes! I forgot to mention that! I almost used pink organza on the black dress but decided against it. Beautiful!!!! 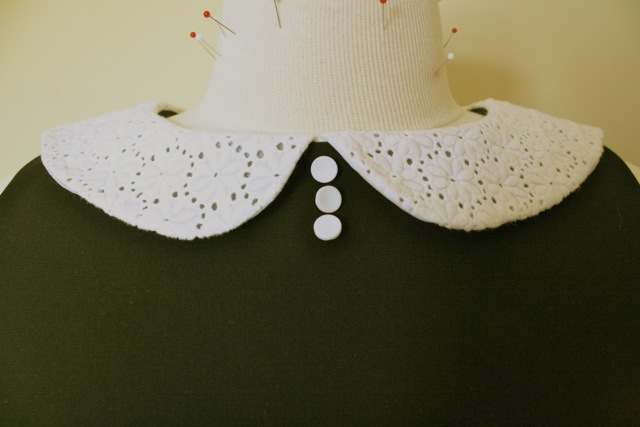 I'm with you: peter pan collar is sound and alive! Fabulous! I love organdy. It was often used as an underlining in vintage garments, giving great body and support. Your hair is looking amazing! Love it! I love Peter Pan collars and these are sweet. I especially like the lace used in the second collar...Do you mind sharing where you got that? (If you mentioned and I didn't see it, apologies!) Thanks! Great Idea! I had it on my list of things to sew one day - a lace collar with matching cuffs, but I had only got as far as that. I will definitely remember this technique - Thank you! Great tip! Those collars are so cute! This is so pretty! It will be my next sewing step! Check out frockfriday.blogspot.com too. I love this idea.thanks. once again I learn so much. Really nice tip, thanks Gertie!